Call to talk to one of our courteous representatives! When it comes to hard-wearing weather protection and aluminum products, Arnold’s Aluminum is the company of choice in Ocala, FL. No job is too big or too small for us! You can trust us to do the work right every time because our highly trained professionals are handpicked from among the best in the industry. Increasing your home's curb appeal is hassle-free when you take advantage of our services. We offer a wide selection of designer louver shutters that not only look great, but can also help reduce your energy bills! Go for a more secure property! 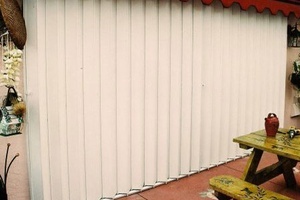 Improve the privacy of your home or office with our high-quality aluminum shutters. These products provide extra security and privacy when closed, and offer an unobstructed view when opened. Protecting your home from the elements is easier than ever here at Arnold’s Aluminum. We are among the most trusted names in Ocala, FL when it comes to roll up shutters, which are the 58mm End Retention hurricane-rated shutters. Here at Arnold’s, we guarantee that you will be satisfied with our services because our team has an acute knowledge in a wide variety of aluminum products and services. The items we offer are both decorative and functional, making them great for any kind of property. In addition, our welded products are powder-coated to maximize their durability. For your peace of mind, we are NAMI Certified (National Accreditation and Management Institute, Inc.) and licensed to operate in Marion County (Comp number 2161). Learn more about our business. Call us today to speak with one of our courteous representatives! © 2019, Arnold's Aluminum. All Rights Reserved.